A fine deli selection that's full of flavour and style! We especially love the smoked beef that's deeply flavoured and works perfectly with the sun-dried tomatoes and mixed stuffed olives. A modern and chic hamper choice this Christmas. Curds & Croust Russet Squire Cheese 165g ? Epicure Duck & Orange Pate 180g ? Inverawe Smoked Salmon Terrine 170g ? 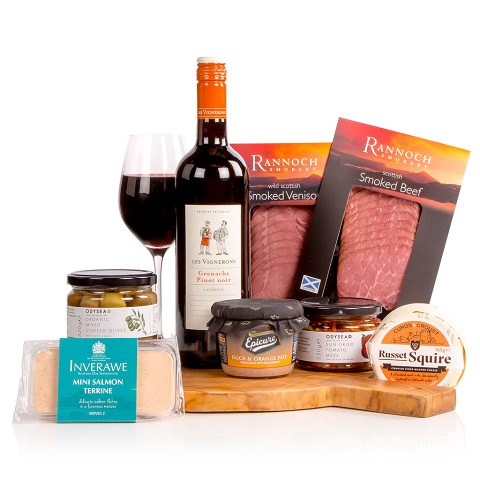 Rannoch Smokery Roast Smoked Venison 100g ? Rannoch Smokery Roast Smoked Beef 100g ?